In the late 1800s there was an interesting physics demonstration that became rather popular. Take a partially evacuated glass tube with wires embedded on either end and run a high voltage across it. 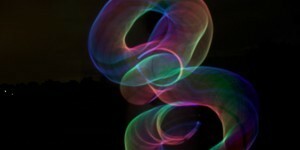 When you did this, the tube would glow, somewhat like a neon light. It was clear that an electric current ran from one wire (the cathode) to the other (anode) through the tube, but it was not clear what was causing the glow. By evacuating more air out of the glass tube, it soon became clear that the light was emitting from the cathode, and so they were called cathode rays. 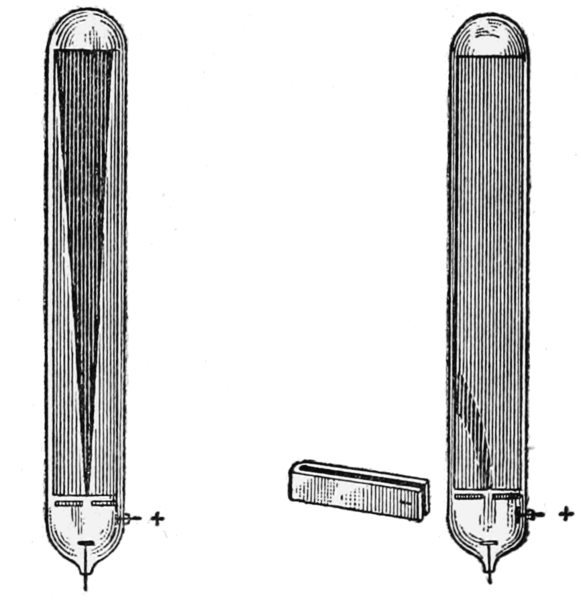 By extension, the glass tube became known as a cathode ray tube. There were lots of ideas proposed to explain cathode rays, but none were particularly satisfactory. Then J. J. Thomson undertook three experiments that changed our understanding of atomic theory. 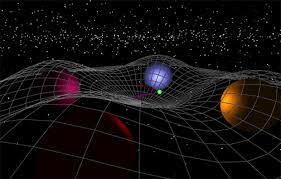 At the time, atomic theory was still in its infancy. There was an indication from chemical experiments that materials were made of elemental atoms, but how they interacted, or what might compose them, was still quite speculative. Various experiments had been performed with cathode ray tubes, but the results didn’t seem to point to a clear solution. But J. J. Thomson thought they might be a component of atoms themselves. Some kind of subatomic particle. To demonstrate this he conducted three main experiments. The first experiment was to determine if the rays had an electric charge. It was known that when a magnet is placed near a cathode ray tube, the rays will be deflected by the magnet. It was not clear, however, if this deflection of the rays also deflected the electric current. 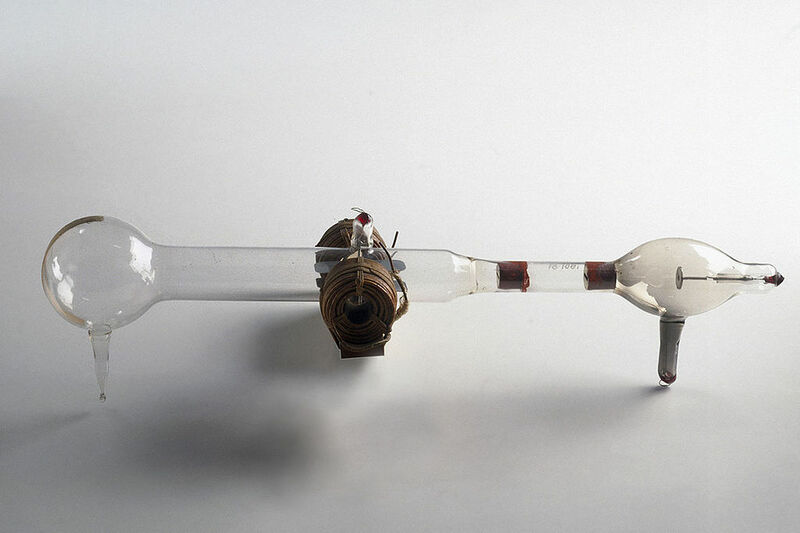 Thomson constructed a cathode ray tube with an electrometer which could detect the current within the tube. When he deflected the cathode rays away from the electrometer, the current was also deflected. Thus Thomson showed that the rays and electric current were connected. His second experiment focused on the effect of an electric field on the rays. One of the confusing results of earlier experiments was that the rays were deflected by a magnetic field, but not by an electric one. If the rays were due to a current of charged particles, then they should be deflected by both. Thomson noted that this isn’t entirely true. If a current is surrounded by a conductor, then it won’t be deflected by an electric field. Thomson thought the gas in the tube might be acting as a conductor to shield the rays from an electric field. So he evacuated the tube still further, and found that in a high vacuum the rays were deflected by an electric field. These two experiments convinced Thomson that his particle idea was correct. So for his third experiment he carefully measured both the energy given to these particles by the electric voltage, and the precise amount the rays were deflected by magnetic fields of different strengths. From this he determined the ratio of the particles’ charge to their mass. The charge to mass ratio he obtained meant that these particles had a very large charge, or their mass was extremely small. Much smaller than the mass of hydrogen. Thomson suspected it was the latter, and subsequent experiments proved him right. Through his work, J. J. Thomson had demonstrated that cathode rays were produced by negatively charged subatomic particles. We now call them electrons, and for their discovery Thomson was awarded the Nobel prize in Physics in 1906.